Bonn, 31 January 2017 – reports have reached the Secretariat that an outbreak of what is thought to be peste-des-petits ruminants (sheep and goat plague) is occurring among the Saiga Antelopes in Mongolia, where already more than 1,000 individuals have died and the epidemic is continuing. Experts from the Saiga Conservation Alliance (SCA), other NGOs, and national and international agencies are on the scene, investigating the causes and trying to stop the spread of the disease before more of the antelopes fall victim to it. In 2016, sheep and goat plague was recorded in domestic animals from two provinces in western Mongolia: Khovd and Gobi-Altai. The veterinarian on the scene, Dr. Richard Kock of the Royal Veterinary College in the UK, cautioned that the disease is spreading much faster than previously thought, and might spread into four western Mongolian provinces, or even more widely. He has recommended that the Mongolian Government declare “emergency status” in the region and stop all livestock movements. Dr. Kock cautions that about 80 per cent of Saiga might die. A working group was quickly established, consisting of all relevant state and non-governmental organizations. Five members of this working group (the Vice-Minister of Environment and Tourism, the Director of the Natural Resource Management Department of the Ministry of the Environment and Tourism, the Director of the Livestock and Hygienic Agency, the General Commander of the National Emergency Agency and the director of WWF Mongolia) have already met the Prime Minister of Mongolia to brief him on the situation. Update from Dr. Lkhagvasuren Badamjav, the Mongolian appointee to the CMS Scientific Council and the Head of Mammalian Ecology Laboratory, Institute of General and Experimental Biology, Mongolian Academy of Sciences, has informed CMS that a meeting has just been held at the Ministry of the Environment and Tourism where Dr. Richard Kock and his team debriefed the Working Group on the preliminary results of the field trip. The Working Group members are meeting the vice-prime minister (Head of National Emergency Council) today (31 January), to implement initial measures and to plan further actions. The Institute of General and Experimental Biology, WWF Mongolia, and Wildlife Conservation Society Mongolia should provide the working group and the Mongolian Government with urgent action plans for wildlife conservation in the region. 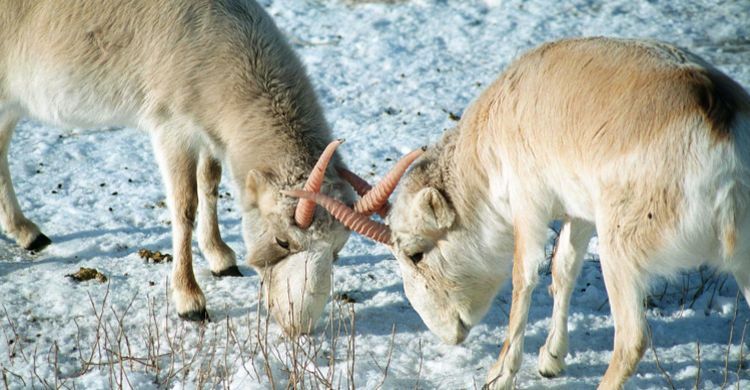 Last week, the Mongolian Government pledged 450 million tugrics (roughly US$ 180,000) for the works on Saiga disease prevention and other activities. Unfortunately, this sum of money will only cover the cost of approximately one month’s work, and more will be needed if the death toll rises. · To stop and prohibit livestock movement in and from the region and many other things related to livestock veterinary protocols. Although far fewer antelopes have died in this mortality event than the devastating incident in Kazakhstan in 2015 when 200,000 animals were lost, the current situation is very serious. Firstly, the Mongolian Saiga population was estimated at just 10,000 in 2016 and is also made up of animals from the much rarer Saiga tatarica mongolica (orSaiga borealis), a different species from the one in Kazakhstan. This means that the current disease outbreak has already claimed more than 10 per cent of this species, and if deaths continue unabated, the Mongolian Saiga will be in grave danger. Secondly, other species, such as Goitered Gazelle, Mongolian Gazelle, and Argali are also affected. David Mallon of the IUCN Antelope Specialist Groupcautions that if the disease has already affected four animal species and possibly others, it really is a disaster - for livestock and wildlife. In autumn 2016 14,000,000 livestock in the area were vaccinated - but given the current disease outbreak, it is clear that this effort was either insufficient, or the vaccine not fully effective. All experts recommend that the Government of Mongolia take immediate action, possibly declare an emergency, and apply their disease response protocols, freezing all livestock movements. "The Mongolian authorities are to be commended for the swift action being taken to tackle the disease and we share their concern about this important population of Saigas. We are all grateful to Richard Kock and other experts who have already been in the field collecting necessary samples and advising local veterinarians and authorities on the appropriate action to take”. Extrapolating from that number, Chimeddorj Buyanaa provides the rough estimate that 2,500 to 3,000 Saiga might already be dead. Another concern is that this outbreak is likely to continue until fresh grass comes up, which will not be before late April in this part of Mongolia. In the short term, field observations and investigations will have to continue, while after the outbreak, additional surveys such as disease diagnosis and population assessment should be conducted. Following the Saiga die-off in Kazakhstan in 2015 emergency protocols - Standard Operating Procedures- were drafted by the SCA, using a small grant provided by CMS. Although specifically based on events in Kazakhstan, their applicability is much wider, and lessons learned in 2015 could be invaluable in helping Mongolia respond to this outbreak. CMS supports the Government of Mongolia in its efforts to deal with this threat, and commends their swift response. More information on the outbreak can be found on the website of the SCA.